Tensions between the Botswana government and lobby group Survival International (SI) have heightened over the alleged forced removal of the Basarwa, or San people, from Botswana's Central Kgalagadi Game Reserve (CKGR), which they consider their ancestral home. The government has called SI's campaign against the removal of the Basarwa as a "cheap, calculated and malicious" use of the Basarwa, and defended its decision not to sign an International Labour Organisation Convention on the rights of indigenous people, arguing that every Motswana, not just the Basarwa, is indigenous to Botswana. "Inasmuch as Basarwa have to preserve their culture, they must also be granted that opportunity to prepare for their own sustenance in the 21st Century and beyond," Clifford Maribe, assistant director of the research and information division in the Foreign Affairs Ministry told IRIN. The government said that of Botswana's 60,000 Basarwa, most of whom live in small, remote communities scattered throughout the country, about 3,000 lived in the CKGR when it was gazetted as a game reserve. The reserve, located in the eastern part of the southern Ghanzi district, was established in February 1961 to protect wildlife resources and provide sufficient land for use by the hunter-gatherer communities there. Maribe said, over time, many residents of the CKGR had abandoned their traditional hunter-gatherer lifestyle in favour of permanent or semi-permanent settlement around or near water sources provided by government to mitigate the effects of recurring droughts. A government study conducted in 1985 found that locations in the CKGR were evolving into permanent, settled agricultural communities, not consistent with the land-use patterns envisaged when the CKGR was established. The Basarwa were abandoning their traditional means of hunting on foot with bow and arrows, in favour of guns, horses and even four-wheel drive vehicles. Residents were also grazing increasing numbers of livestock inside the reserve, it said. According to SI, "forcible relocations" of the Basarwa from the CKGR took place in 1997 and 1998. 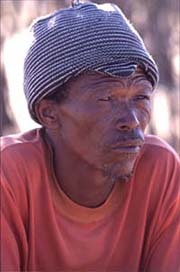 "Many Bushman families then tried to return, but faced difficulties in doing so. After the relocations stopped, the government continued to pressure and intimidate people into relocating. In early 2002, pressure intensified, and almost all those left in the reserve were driven from their homes." SI allege that the government's interest in the CKGR land, which they once considered barren, was because it houses one of the world's richest diamond fields. Under Botswana law, all proceeds from mining activities are not subject to claims of ownership of mineral rights from communities resident in the areas of exploration and mining development. There is also concern over the exclusion of the Basarwa from the country's House of Chiefs, the non-recognition of their tribal status, and of their form of land use as legitimate. Test drilling has already taken place at Gope, and mining company BHP Biliton has allegedly invested very heavily in the Kalahari and Khutse areas through a subsidiary company, Kalahari Diamonds (which in turn has set up another subsidiary called Godi) with the support of the International Finance Corporation, a branch of the World Bank. Only one Motswana citizen sits on the Godi board - Archibald Mogwe, a senior political advisor to former Botswana president Sir Ketumile Masire, and formerly the minister of mineral resources. SI said that diamond company De Beers had also spent a large amount of money studying the Gope site and had commissioned anthropologist James Suzman to study Bushman land rights in the CKGR. Early in 2002, De Beers reportedly said it had no plans to mine "for the foreseeable future". Towards the end of 2002, a De Beers spokesperson was quoted by SI as saying: "We cannot say we will never mine it". According to Maribe, the "government has made no secret that there is general exploration for minerals throughout the country, including the CKGR. However, at this point in time, nothing other than the Gope deposit has been found in the CKGR." He conceded: "If a commercially viable deposit is discovered in the CKGR, the merits and demerits of mining the deposit will be assessed, as government has never said, nor is it saying, that mining is banned in the CKGR." The Botswana human rights group Ditshwanelo, which is part of an NGO negotiating team that has engaged the government in discussion over the fate of the CKGR Bushmen, has criticised SI's stance. "Survival International has continued its campaign against the Government of Botswana through focus on Botswana diamonds and De Beers. Survival International believes that diamonds are the reason for the resettlement of the Basarwa to two settlements, New Xade and Kaudwane, which are outside the CKGR. Ditshwanelo is not convinced that diamonds are the reason for the relocation of the Basarwa," Ditshwanelo said in a statement in November last year. In a speech in June this year, President Festus Mogae explained that a drive to modernity lay behind the relocations. "Over the years people have been encouraged to move out of our game parks and reserves for two fundamental reasons. The first is that their modern economic activities, be it hunting, arable and/or pastoral agriculture or some other commercial activity are inconsistent with the primary purpose of the parks and the reserves ... The second reason that people move out from game parks is to give themselves and their children the benefit of development." To address the interests of the relocated Basarwa, the government has engaged a local NGO, Permaculture Trust Botswana, to assist in identifying income-generating projects like backyard gardens, raising poultry, and brick-making for the construction of houses in the new settlements of Kaudwane and K'Goesakene in New Xade. Reverend Moiserele Dibeela, principal of Kgolagano College of Theological Education, said: "This is the main problem with government - in the way it has handled the relocation of Basarwa from the CKGR, is that they may mean well, but they appear very condescending and patronising. "There would have been no issue if they had followed the consultative process from day one. But when we thought the consultative process was going on, they cut water, blocked access to the reserve as well as incentives to stay on the reserve, and came up with a grand scheme for their (the Basarwa's) social upliftment." SI director Stephen Corry warned: "The evicted Bushmen will end up like reservation Indians in North America, or Aboriginal fringe-dwellers in Australia - wracked by alcohol and substance abuse, social disintegration, HIV/AIDS, domestic violence and poverty. This is happening now in the relocation camps, where many Bushmen are desperate for their land. "Indeed, the government has made no secret of the fact that it wants to end the Bushman way of life and assimilate them once and for all into the dominant tribes which control Botswana. It wants them to disappear." However, the matter may finally be settled by the courts, as 242 Basarwa are currently taking the government to court to be allowed to continue living in the reserve.